A bit unusual, but some things have happened that couldn’t wait until the weekend. First and foremost, the May sale has been extended! You can now get the first Monkey Queen ebook, Of Introductions And Abductions, through May 31 for just 99 cents US/CA/AU, £0.99, and €0,99! 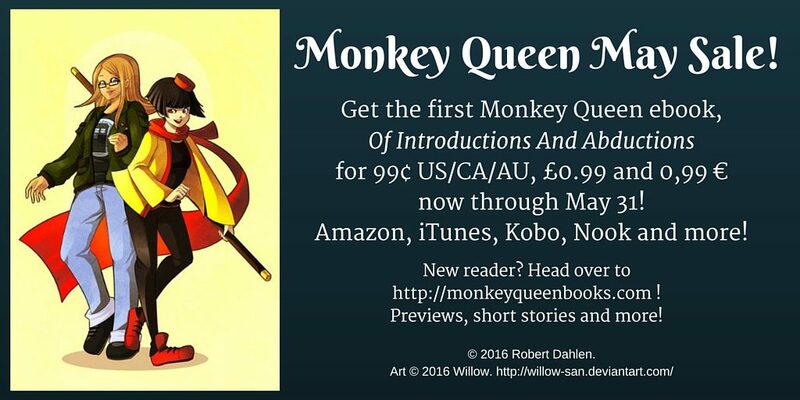 Get buy links in the “Welcome!” post at the top of the page, or search Amazon, Kobo or iTunes for “Monkey Queen”! More after the cut. A quick note for those shopping at Kobo, and related stores like Indigo and Fnac: For the next few days, I’ve had to increase the price on Of Introductions And Abductions back to $2.99 US. This is because of a special promo I’ll be taking part in on Kobo; I needed to bump the price up temporarily to take advantage of it. It’ll drop back to the sale price next Monday, May 16, so feel free to wait until then to grab your copy. Sorry for any trouble this causes. Heads up: It’s time for Doubleclicks Live! My favorite nerd-folk-rocking, cat-keyboard-wielding duo has a live show scheduled for this Saturday, May 14, at 4:00 PM Pacific! Click here for more info! And as most of you have heard by now, Disney has announced that their video game division is shutting down and Disney Infinity will be discontinued. Dagnabbit. Regular readers here know how much I love Disney Infinity; my collection of figures has been growing steadily, and they’ve been great subjects for a lot of the silly photos I post. I thank the folks at Avalanche Studios and Disney for bringing out the game and doing such a good job with the figures.